Mentor Hours with Jeffrey C. Robbins from Messerli & Kramer P.A. The #VegasTech community is invited to register for a 1-on-1 Mentor Hours session with Jeffrey C. Robbins, Attorney for entrepreneurs and angel/venture investors at Messerli & Kramer P.A. Mentor hours with Robbins will take place 2:00-4:00 on Thursday, April 28, 2016 at Work In Progress. Robbins started holding monthly office hours at Work In Progress at the beginning of 2016 and says he has seen the sessions grow over time. Robbins says a successful Mentor Hours session is one where both parties walk away from the conversation with something of value. Robbins has started two companies of his own in the past, and knows firsthand that being a founder can be lonely and daunting at times. While there are many resources available on the internet to read and learn, time is the most precious commodity for founders and entrepreneurs. In some areas, it’s just easier to turn to others who’ve “been there, done that” for advice. Robbins says that when working with a mentor, it’s important for a founder or entrepreneur to know what it is that they want to learn. Then, it’s time to select a mentor who likely has the requisite experience to be helpful on the issue at hand. “And it’s cool when a mentor gives you advice about something and it works for you!” he said. 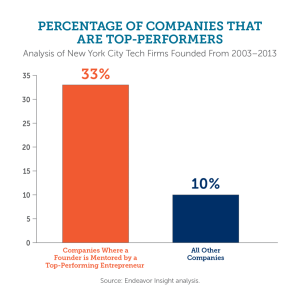 Recent analysis by Endeavor Insight of the top-performing companies in New York’s tech sector revealed several interesting patterns. The team found that many of the entrepreneurs leading these startups had strong personal connections to the founders of other successful companies. One of the most powerful connections identified in the analysis was mentoring relationships. When he reflects on mentors he has had during his career, Robbins points to the law firm founder who hired him for his first job in 1983. When it comes to helping founders and entrepreneurs with fundraising planning and challenges, Robbins decided to launch AngelPolleNation as an event for the community to gather and solve this challenge together. “I’m now starting to build better local knowledge about the investment climate with the inaugural launch of our AngelPolleNation Las Vegas networking events in February. The next one is Tuesday, May 24, 2016 and I’m on the hunt for presenting companies,” he said. To register for Mentor Hours with Robbins, visit Work In Progress’ website!